Oh George! We had to Double Take this Takei image today (M-kay? ), but not for the reasons you'd think. This is where we live! 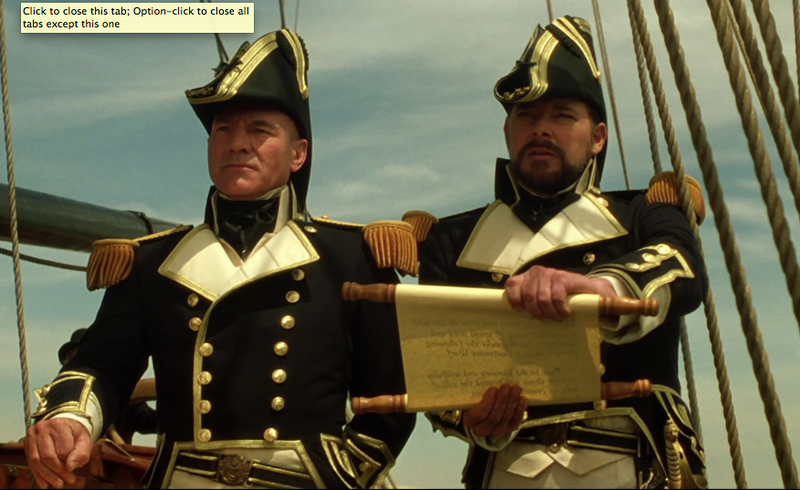 We clapped with gay glee when we saw our city's proud historic dockyard being shared by the good Captain Sulu. 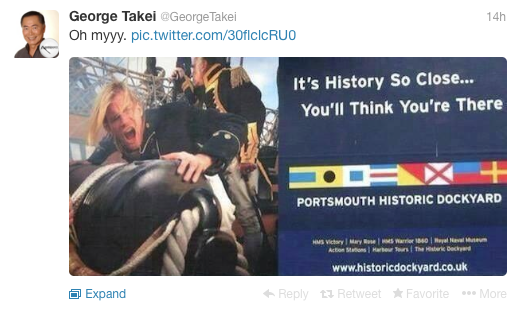 As you can see we're a liberal bunch here in Portsmouth so feel free to pay us a visit anytime Mr Takei. "Or we could just make him walk the plank?" So Donald Trump is going to give an announcement tomorrow that's going to blow a hole in Obama's re-election campaign. Anyone else reminded of that time Commander Tomolok threated to beat up Captain Picard after school tomorrow to display the Enterprise's broken hull in the Capital city of Romulas? The Trekkie Girls have a bit of political experience and understand that one way Obama could diffuse the situation is to take the sting out of the story, by announcing it (whatever it is) first. We suggest this option because we know he doesn't have a couple of cloaked Klingon Bird of Preys hiding behind the Whitehouse. To help we have hired an expert team of Betazoids, Vulcans and Ocampa to read the President and Trumps mind so we can give you the scoop first.